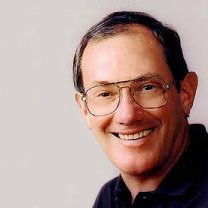 Ron Olitsky began working with Underground Service Alert of Southern California (USA/SC) aka DigAlert in September 1980. In 1986 he become President of DigAlert. Ron was instrumental in the creation of the Common Ground Alliance (CGA) and served on the board since its inception. Ron had many achievements and participated on many committees, past chairman of One-Call Systems International, One Calls of America and California Regional Common Ground Alliance to name a few. He traveled all the time, either to stakeholder meetings, committee meetings or to DigAlert safety events. Ron was an avid runner, equestrian and animal lover. He ran every morning no matter where he may have been at the time. On October 3rd 2005 Ron suffered an aneurism and passed away at home. He left behind a wife, 2 sons, 3 grandchildren and countless friends and colleagues. Ron's death sent shockwaves throughout the industry. His impact on the "Call Before You Dig" community and message cannot be measured. In 2006 USA/SC created the Ron Olitsky Extra Mile Award in his honor. An annual award for an individual or company who has shown true dedication to efforts that enhance underground damage prevention activities. USA/SC takes nominations for the Ron Olitsky Extra Mile Award throughout the year from July 1st through June 30th the following year. During the July USA/SC Board of Directors meeting the nominees are voted on for that year. The recipient is then notified and presented the award at the next Board of Directors meeting in October. If you know someone or a company that meets these requirements and would like to nominate them, please use the link to the right, fill out the form and send it back to USA/SC. Jim was hired at DigAlert in April 1996 and quickly climbed the ladder, including being promoted to IT Manager in 2003 and Vice President in 2007. His accomplishments have led us to be a leader of the industry in technology resulting in other centers contacting Jim to be able to utilize our network for a fee, contributing to the financing of the center. Jim has shown true dedication to the promotion of activities that enhance damage prevention, as well as educating the public to contact 811 before digging. USASC’s award winning participation in the Rose Parade in 2014, 2015 and 2018 reached millions across the country! This was not only beneficial to DigAlert but nationwide in spreading the word to contact 811. To assist in the financing of these events, Jim was able to recruit the participation of 4 centers in 2015 and 9 centers in 2018. His most recent activities included advertising for the Ducks playoffs, Angel games and Laker games which resulted in excellent viewer coverage. Jim always goes the extra mile to make sure the message to contact 811 is highly visible to the public and he ensures that our center runs efficiently. Many local heroes go unnoticed. But, at DigAlert you have the ability to recognize an individual for high remarks. Jim Schwilk is a hero who many look up to day in and day out. In December Jim spends innumerable hours at the DigAlert/811 Rose Parade Float acting as an ambassador for safe digging. Jim spends his time at the floats greeting and educating the thousands of volunteers on how important contacting 811 is before you dig. Every connection Jim makes helps spread the Safe Digging message to the Southern California region and beyond. His commitment and passion for saving lives are exciting! He makes you want to call 811 every time you grab a shovel. He makes you think twice before you plant a tree or open a hole up at a construction site. Jim wants each and every one of us to be safe. I know Jim Schwilk embodies the Ron Olitsky Extra Mile Award more than any other person. I implore you to award Jim Schwilk with the 2018 award. For the past couple of years, Senator Jerry Hill and his staff have worked tirelessly on the most significant changes to California Government Code section 4216 since 2007. He has been a champion for safe digging practices since 2008 when he took office as an Assemblyman before moving to the Senate in 2012. In 2015 when he introduced SB 119, he worked with all stakeholders to get a comprehensive safe digging bill passed. Unfortunately, the Governor vetoed the bill, but that didn’t deter the Senator. The next year he reintroduced the exact same language and worked with the Governor’s office as well as the other stakeholders to pass the Dig Safe Act of 2016. Senator Hill’s goal is to not have any more fatalities due to unsafe digging practices. He has gone the extra mile to protect not just his constituents but everyone in California. In a letter to the USA/SC Chairman of the Board	of Directors in May of 1999, Board member Mike Romley, representing Equilon Pipeline, explained that he had to resign because he lacked	adequate time but offered a replacement	candidate: Teri Wohlgemuth who had already worked in the pipeline industry for 17 years and was very experienced with pipeline operations	and maintenance. She was at the time supervising the line locators in the Los Angeles Basin. Although Equilon Pipeline changed its name over the years to Shell Oil and now Shell Pipeline, the company has always been a great	friend to Underground Service Alert. Their representative Director, Teri, has never changed her identity and she has always gone that extra	mile on every occasion. She acted as Chairman of the Board from 2005 to 2008. When her work assignment was changed, she made sure that the Center had a Shell representative to continue their support. And, when it is sometimes difficult to find someone willing to give of their time to participate in Board activities, she returned. In 2014, Teri came back for more! Teri Wohlgemuth takes the time to get to know the people she is interacting with, she does the research and she comes up with quality results. She follows through and definitely goes the extra mile. Usually when a person retires, they simply want to relax and enjoy life. When Steve Woo retired from AT&T as an engineer, he simply changed hats and jumped on board with HCI as his employer. Steve is an active member of the CARCGA and serves as chair of the SSIP committee. To describe him as passionate about safe digging is an understatement. He is proactive about potential legislation to improve GC 4216 and he is one of the more visible encouraging forces for contractor involvement in the excavation community. Whenever and wherever, there is a SAFE event held, Steve is there to represent contractors and to answer questions which arise. He is totally supportive of Underground Service Alert, but he goes the extra mile. Steve not only answers questions, he goes one step further and asks questions as well. How can things be improved? What would make Southern California a safer environment for excavation? Steve understands the viewpoints of both contractor and utility owner and shares his insight and his probing questions in hopes that tomorrow might be a safe world for all. Over 25 years with Edison and 15 years working with transmission, Robert is a lineman who works closely with the supervisors. He assisted in coordinating an Underground Facility Manual, held training class at Edison on the DigAlert® process. He is available by phone 24/7 to assist co-workers in the prevention of damages and/or injuries. John was instrumental in the development of the initial one call concept. Heading the list of his many achievements is 38 years of service as a Civil Engineer, Power Systems Operations and Management for Los Angeles Department of Water and Power. He has been part the Board of Directors at USA/SC for many years and still holds seat on the Board as well as on the Executive Committee. After retiring in November 2006, John has remained extremely active in the industry by consulting and providing expert witness depositions. His passion for damage prevention and desire to educate on the one-call process is exemplified through his devotion and commitment to USA/SC. John actively participates in discussions, bringing to the table his many years of experience, knowledge and insight. Repeatedly, he has shown that his foremost concern is what is in the best interest of the call center. Marc is the Public Awareness Program Manager and authored as well as oversees So Cal Gas and SDG&Es's program involving 19 intercompany departments with the goal of public safety and property protection by increasing awareness and knowledge of the One-Call notification system. Marc is a strong advocate and supporter of the objectives of DigAlert and fervently promotes the dissemination by SoCal Gas and SDG&E of dig-in damage prevention information. SoCal Gas and SDG&E have seen a significant reduction in the number of dig-in damages since Marc’s implementation of the Public Awareness Program. In 2006, dig-ins by homeowners and contractors were approximately 5700 for SoCal Gas and 630 for SDG&E. The SoCal Gas damage numbers saw significant percent reductions over each subsequent previous year of 18% for 2007, 17% for 2008 and 22% in 2009, dropping to 2660. SDG&E damage numbers also showed significant reductions over each previous year as well, 4% in 2007, 33% in 2008 and 11% in 2009, dropping to 297. John completed training in Cal OSHA Regulations/Excavation, Safety training and construction safety. In August 2008, John was pleased to be asked to speak at the Damage Prevention Conference in Las Vegas, NV. John is also a Hazmat Instructor, CPR Instructor and a Locator Trainer. On July 14th, 1980, when he was just 19 years old, John began work at Eastern Municipal Water. Pauley Construction is “A company built on client satisfaction, quality, commitment, and professionalism.” It’s their company statement and they seem to portray it very well. Pauley staffs a full-time safety director and believes firmly in safety training for all of their employees. The company is family owned and operated and was founded in 1991. It’s home office is located in Phoenix, Arizona, but they have offices throughout the southwestern United States. Their field of expertise is utility construction. They are very pro-active in their commitment to safety of their employees. Their safety training is done on a regular basis in an effort to prevent problems from occurring rather than as a remedy to repair problems that have already happened. Marshall's dedication to damage prevention is evident in the way he performs the duties of his position as Area Manager, Compliance Damage Prevention, Construction & Engineering at AT&T Network Services. He puts in long hours. Marshall is very attentive to the locations on the DigAlerts AT&T receives and is educated with the ticket taking process. He currently serves as USA/SC Chairman of the Board of Directors and also assists USA/SC by serving on various committees along with being a known proponent of the California Regional CGA. Marshall takes an active role in the contacting of contractors to make sure they are compliant with the regulations of California Government Code 4216. On a personal level, he showed great compassion and concern for the employees of USA/SC at the time of Ron’s passing by taking time to come by the office to offer his assistance and condolences. He is never too busy to offer a compliment or thank you for a job well done. His work ethics are to be admired and an inspiration to those who have the pleasure of his association. 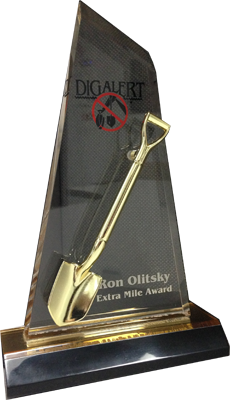 In remembering Ron Olitsky, USA/SC’s president who passed away last year, DigAlert created a special award in his name. This is to honor the individual who best emulates the promotion of the one-call concept. The unanimous first choice was George Hendrick. George began his pursuit in providing safety for the digging public over 30 years ago and became instrumental in establishing the Southern California one-call notification center. Even though he retired from Southern California Gas Company in 1991, he continues to this day actively serving as a member of the USA/SC Board of Directors. His undisputed knowledge of the industry provides valuable insights for those who decide the paths taken by DigAlert. It was appropriate that the first award be presented by Olitsky’s wife, Fern at the 30th Anniversary Celebration held September 16th in Long Beach. A plaque bearing his name and future recipients will be displayed in the DigAlert office.